I'll have to check things out again, but currently AskMrRobot is showing me the following for stat weights. This means you should always choose the best DPS weapon, followed by agility, followed in secondary stat preference of crit, haste, and then mastery. I'm not sure if this is cached in browsers or if they just updated their weights in the last few days. I'll have to look at it more. One of my personal reforging issues has been that I'm swimming in +hit. And I got a new and better weapon that has +hit while my old one does not. 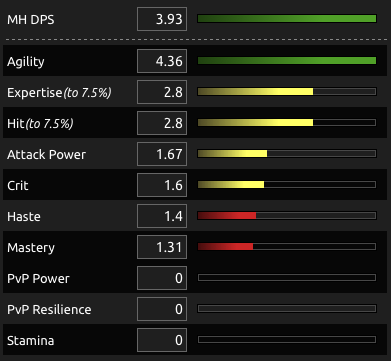 I checked FemaleDwarf and she told me even if I'm swimming in extra (and useless) hit rating it is an upgrade for overall DPS. That's cool. So when I look at what AskMrRobot suggests I go through the differences of what I have. Yep, it suggests I remove the two +80agil/+160hit gems in my shoulders and replace them with +160agil gems. Even with the set bonus loss of +120agil, I'm ahead of the game. But it's worth stopping to consider another option. Using the stat weights we see that 320 agil should be multiplied to 4.36. We also see that any stamina value should be multiplied to zero. The stat weight of stamina really isn't zero. It is zero for the purposes of damage dealing. Obviously all our gear comes with some and we don't reforge it off, but there is some value to surviving a two-shot combo boss mechanic. Hypothetically, you or someone you raid with has done something wrong if you get two-shot. Or you are very undergeared for the instance you're in. It isn't "RNG". But having some cushion can help, because accidents happen. Part of me is tempted to put in agil/stam gems and wind up with 280agil/240stam instead of 320agil. Maybe it's just the pet-tank-wanna-be in me though. Trading 40 agility for 240 stamina isn't quite enough stamina to make me do it. I'd probably give up even more stamina for agility. But that price is pretty close to my break-point. 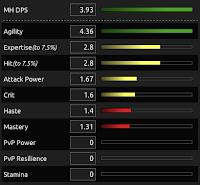 A little more stamina, or a little less agility and I'd go for a little more survivability. I was way over on Hit until just recently (just replaced my trinkets and a couple other items so it's not a problem anymore). As you said, the agi-stam gems only make sense if you are still getting the same amount of agility (or almost the same).